Bengaluru: Hundreds of BJP workers protesting against celebration of Tipu Jayanthi by the Karnataka Government on November 10 courted arrest across the state, even as the preparations are in full swing by the State government for the celebration. 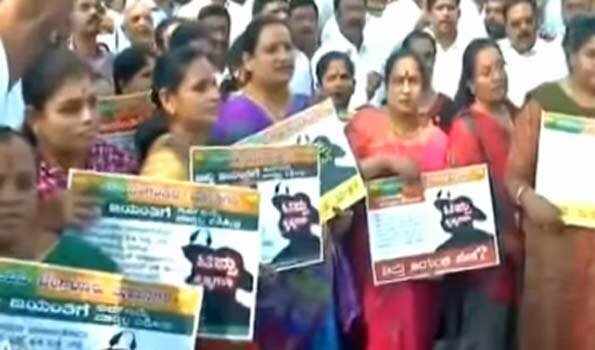 BJP workers picketed and shouted slogans against JD(S)-Congress government across Karnataka. In the State Capital the agitation was led by senior BJP leader and former Deputy Chief Minister R Ashok. Similar protests were held in all District headquarters. At Madikeri in Kodagu District, where violence was witnessed during the same event during 2016 and 2017, former Legislative Assembly Speaker K G Boppaiah condemned the State government move to go ahead and celebrate Tipu Jayanthi against the interests of Kodagu people as the 19th century warrior king Tipu Sultan had guilty of murder of thousands of people in Kodagu.